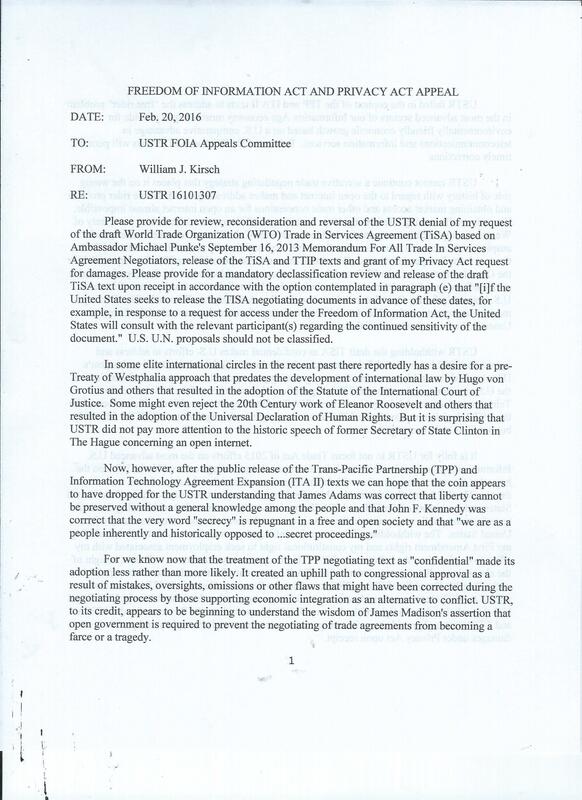 Beryl Lipton filed this request with the U.S. Trade Representative of the United States of America. For future reference, Jacqui Caldwell is retiring at the end of March. Please direct future FOIA inquiries to FOIA@ustr.eop.gov. I would appreciate it if you would also let your colleagues know. The USTR FOIA office received your Freedom of Information Act (FOIA) request dated March 14, 2017 and assigned it tracking number FY17-48. Please cite this number in any future communications with our office regarding your request. 1. 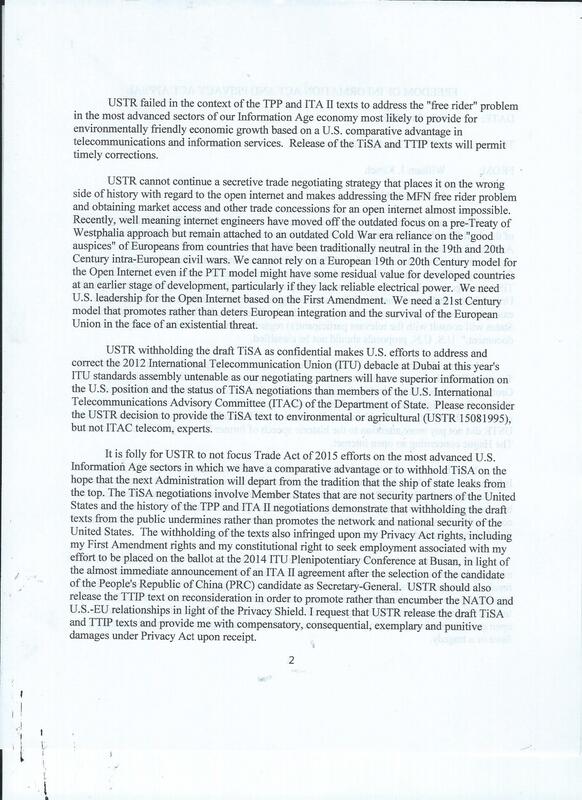 USTR FOIA Appeals Log for 2015 and 2016: we are releasing this document in full. 2-3. All appeal letters and opinion letters associated with appeals for which the determination was to reverse/remand: We are releasing two (2) documents in full. Portions of the remaining three (3) documents have been redacted because we reasonably foresee that disclosure would harm an interest protected by FOIA Exemption 6, which protects personnel and medical files and similar files, the disclosure of which would constitute a clearly unwarranted invasion of personal privacy. The information that has been withheld under Exemption 6 consists of personal information, and we have determined that the individuals to whom this information pertains have a substantial privacy interest in withholding it. Additionally, we have determined that the disclosure of this information would shed little or no light on the performance of the agency’s statutory duties. Because the harm to personal privacy is greater than whatever public interest may be served by disclosure, release of the information would constitute a clearly unwarranted invasion of the privacy of this individual and we are withholding it under Exemption 6. 4. All appeal letters and opinion letters associated with appeals for which the determination was to affirm: We are releasing six (6) documents in part. Portions have been redacted because we reasonably foresee that disclosure would harm an interest protected by FOIA Exemption 6. 5. Any instructive or guiding materials are publicly available. Please visit https://ustr.gov/about-us/reading-room/freedom-information-act-foia/foia-reference-guide. 6. Name and contact information for the appropriate appeal authority: Fred Ames, FOIA Appeals Official, Mailing address: FOIA Office, Office of the US Trade Representative, Anacostia Naval Annex, Building 410/Door 123, 250 Murray Lane SW, Washington DC 20509, Email address: FOIA@ustr.eop.gov. This constitutes a complete response to your request. You may contact me at 202-395-4990 for any further assistance and to discuss any aspect of your request. Additionally, you may contact the Office of Government Information Services (OGIS) at the National Archives and Records Administration to inquire about the FOIA mediation services they offer. The contact information for OGIS is as follows: Office of Government Information Services, National Archives and Records Administration, 8601 Adelphi Road-OGIS, College Park, Maryland 20740-6001, e-mail at ogis@nara.gov; telephone at 202-741-5770; toll free at 1-877-684-6448; or facsimile at 202-741-5769. If you are not satisfied with the response to this request, you may also administratively appeal by writing to: USTR FOIA Appeals Committee, GSD/RDF; Fred Ames, Anacostia Naval Annex, Bldg. 410/Door 123, 250 Murray Lane, S.W., Washington, D.C. 20509. Your appeal must be postmarked or electronically transmitted within 90 days of the date of the response to your request. Both the letter and the envelope should be clearly marked: “Freedom of Information Act Appeal" and should include a reference to the FOIA Case File number listed below. Heightened security in force may delay mail delivery; therefore we suggest that you also email any such appeal to foia@ustr.eop.gov. Thank you so much for your quick response! Would it be possible to receive the initial appeal letters that the requesters sent to your agency? Portions of the documents are redacted because we reasonably foresee that disclosure would harm an interest protected by FOIA Exemption 6, which protects personal information. We have determined that the individuals to whom this information pertains have a substantial privacy interest in withholding it and that the disclosure of this information would shed little or no light on the performance of the agency’s statutory duties. Because the harm to personal privacy is greater than whatever public interest may be served by disclosure, release of the information would constitute a clearly unwarranted invasion of the privacy of this individual and we are withholding it under Exemption 6. I have not yet located the appeal letters for the remaining 4 appeals, however, I have asked my FOIA colleagues who have worked at USTR longer than me to search their individual folders. Because I will be out of the office tomorrow, I did not want to delay releasing the letters I found. I will be back in touch early next week. We are releasing them to you in full. Thank you *so* much for your response to this request. We'll let you know if we have any other questions, and I really hope the rest of your week is lovely.